Kilin Boardman-Schroyer is steering a collaborative effort to help young D.C. residents get back on track to completing their high school education. Tyrina Brown spent only two weeks as a sophomore at Theodore Roosevelt High School in Washington, D.C. She stopped because her mother was sick with ALS, or Lou Gehrig’s disease. “Mom didn’t have a home health aide and no one else could take care of her,” Brown said. She ended up spending almost a year at home. After her mother passed away, Brown got pregnant and eventually entered the foster care system. She was determined to complete her high school education, so she enrolled in a program that offered online courses on the way to a diploma. But the program lost its accreditation and Brown found out her new diploma was worthless. After she landed a job with a local nonprofit, a supervisor told Brown about a new center the D.C. government opened to help young people who left high school before graduating. Now, with the support of the D.C. ReEngagement Center, Brown is getting her life back on track. By early 2017, she will complete her work toward a high school diploma from an adult public charter school. In addition to connecting Brown to the school, the center has provided financial support for transportation and helped her find affordable child care for her son, Malachi, now 6 years old. Her “reengagement specialist” at the center even recommended Brown for a paid internship with the D.C. government. “I didn’t know what to expect, but they really helped me with everything I needed,” said Brown, now 24. Across the nation’s capital, more than 8,100 people between the ages of 16 and 24 don’t have a high school diploma or credential and are not currently enrolled in school. 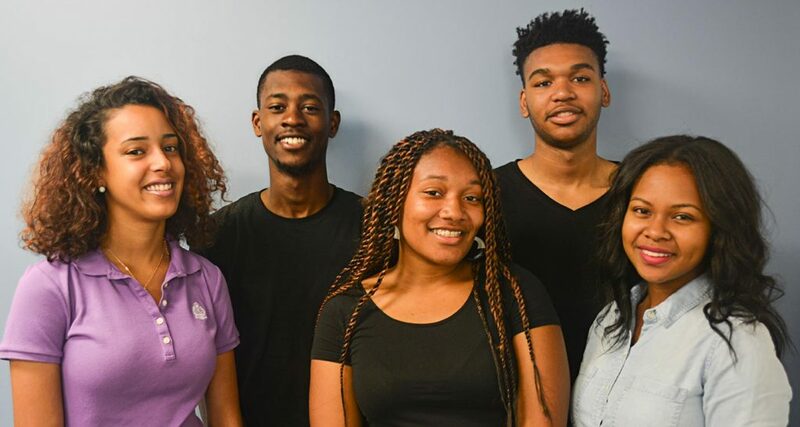 Like Tyrina, these young people — referred to as disconnected, disengaged or opportunity youth — face a variety of barriers to continuing their education and finding good jobs and careers. These barriers include a lack of access to affordable transportation and child care, mental health issues, criminal records, homelessness and more. Many simply don’t know what resources are available to help them get a diploma or GED. Enter the DC ReEngagement Center. The center describes itself as a “single door” through which young people can restart their education and find the support they need to do so. “What this is really about is bringing together all the resources that are out there to help these young people succeed,” said Kilin Boardman-Schroyer, the D.C. government official who oversees the center’s work. Boardman-Schroyer arrived in D.C. from a small town in New York in 1999 to attend American University, where he did both undergraduate and graduate work in law and public policy. Today, he is deputy assistant superintendent for Postsecondary and Career Education with the Office of the State Superintendent of Education in D.C. What this means is that he oversees much of the District’s work to ensure that young people have good and affordable options for education and job training. His portfolio includes GED testing, career and technical education, and adult education. Boardman-Schroyer was hired by the District after serving on the staff of a D.C. City Council member who chaired the Committee on Housing and Workforce Development. The job with the council member entailed working with government, advocates, issue experts and others to craft legislation aimed at strengthening the District’s workforce system, including “second-chance” systems for disconnected young people. For a number of years, leaders and advocates inside and outside D.C. government had been calling for more attention to the problems facing the city’s disconnected youth. In 2011, the case for action was bolstered by a Brookings Institution study finding that nearly one in 10 D.C. residents between the ages of 16 and 24 were not in school or not working. The Brookings data led to additional research on the problem, along with a feasibility study to explore new and expanded programming to support disconnected youth. Around the same time, interest in the issue was percolating across the country, particularly with the release of the influential 2014 report, “Don’t Call Them Dropouts,” by the America’s Promise Alliance. The feasibility study, which was funded by the D.C. government, outlined five priorities that ultimately defined the rationale and mission for the D.C. ReEngagement Center (see box). Armed with both the study and local data on the scope of the problem, Boardman-Schroyer and his colleague, Celine Fejeran in the Office of the Deputy Mayor for Education, became key advocates in city government for establishing the new center. Before long, the idea had the strong support of then-Mayor Vincent Gray, who approved funding for the center in the city’s fiscal 2015 budget. Boardman-Schroyer and Fejeran were not alone in urging the City to do more for disconnected youth. Also making the case for action were the members of the Disconnected Youth Change Network. It’s one of five cross-sector networks created as part of Raise DC, the city’s comprehensive effort to improve educational outcomes for young people. The change network’s members come from philanthropy, community-based organizations, government agencies and educational institutions with a stake in helping disconnected youth. “Raise DC gave this group the infrastructure to really push on some of these issues,” said Boardman-Schroyer, who took over Fejeran’s role as co-chair of the network when Fejeran moved to a senior staff position with Raise DC. Boardman-Schroyer co-chairs this network alongside staff from Venture Philanthropy Partners, a local foundation. “Groups had been meeting and talking informally and unofficially for a while, but now they have a real platform to push for solutions,” he said. The D.C. ReEngagement Center opened in October 2014 at the headquarters of the D.C. government’s Department of Employment Services. The building is in one of D.C.’s poorest areas with a high concentration of African-American residents. The center’s offices on the second floor occupy a large open space. The windows looking out on Minnesota Avenue are lined with cubicles where four “reengagement specialists” meet with clients and do their work. On the opposite wall is a bank of 10 computers where clients can study, surf the web or research colleges, jobs and careers. There’s a large closet stocked with free items for clients, from professional clothing and winter coats to diapers and more. There’s even a makeshift play area where clients’ kids can play with toys. “We try to make it a welcoming environment where people want to come and where they can find all the support they need,” Boardman-Schroyer said. The ReEngagement Center is conveniently on multiple bus lines and near the D.C. Metro. But to make sure it is supporting as many young people as possible, its services also are offered at other locations across the city. Every week, one or more of the center’s reengagement specialists has office hours at youth drop-in centers in two other neighborhoods, including Columbia Heights, a predominantly Hispanic and immigrant community. Monthly office hours also are held at the city’s main resource center for homeless families, and the specialists will make scheduled visits to the D.C. jail from time to time to meet with individuals leaving the prison system. “We try to be as ‘out there’ in the community as we possibly can. The goal is to be as accessible and as flexible as possible so it’s easy for people to find us,” said Boardman-Schroyer. He added that the center’s launch was accompanied by a wide-ranging outreach campaign to ensure that frontline city staff, police and community agencies knew about its services. “The fact is, while this population is disconnected from education, they are often connected to other programs throughout the city. And so we wanted to make sure from the very start that our natural allies, who may already be working with this population, knew about us and could make referrals,” he said. Boardman-Schroyer oversees the D.C. ReEngagement Center from his post at the Office of the State Superintendent of Education, with day-to-day activities managed by Center Director Ja’Sent Brown, Deputy Director Isaac Hammond-Paul and a team of four reengagement specialists. However, Boardman-Schroyer is quick to point out that helping disengaged youth isn’t just the work of one agency, or of the D.C. government alone. The work requires strong collaboration with other agencies, schools and community-based organizations. As the official advisory body for the ReEngagement Center, the Disconnected Youth Change Network includes representatives of many of these partners. The change network’s members also play an active part in ensuring that the center’s clients have access to a range of supports and services. “It’s a great collective impact effort where we’re bringing in resources from just about everywhere,” Boardman-Schroyer said. He pointed to the involvement in the network of several “second chance” public charter schools where ReEngagement Center clients regularly are referred so they can complete their work toward a GED or high school diploma. Other network members include the Latin American Youth Center in Columbia Heights and Covenant House, a leading provider of GED and adult education for homeless and disconnected youth in the city. Since late 2014, roughly 1,000 young people have connected with the ReEngagement Center by participating in a short intake process where staff capture their basic demographic information. Of this larger population, more than 560 young people have subsequently engaged in a longer intake that includes interviews and other activities to assess their goals and needs. More than 400 ReEngagement Center clients have enrolled in a high school or GED program to date. In addition to gathering information on clients served, Boardman-Schroyer said the center systematically collects data on the challenges facing its clients so city officials and their partners in the network can have a better idea of what additional supports these young people need. One barrier highlighted is that students can no longer ride free on the city’s subway and bus system after they turn 22, inhibiting the center’s older clients’ ability to complete their education. In addition, free use of transit is only available to students in accredited public schools, including charters, but not in education programs administered by community-based organizations. Boardman-Schroyer said another big barrier for the center’s clients is lack of access to affordable child care for young parents. “Most child care options are only available during the day, but many youth in this population work during the day and have to attend school at night,” he said. The Disconnected Youth Change Network has become an important forum for raising these issues and continuing the work of expanding and strengthening services and support for this vulnerable population. In an example of its continuing leadership, the change network was a key force in the 2016 launch of a new website, BackonTrackDC.org. A project of the D.C. ReEngagement Center, the website is designed to help disengaged youth and adults by providing up-to-date and reliable information on more than 20 adult education programs throughout the District. In other work spurred by the change network’s discussions, Boardman-Schroyer is collaborating with colleagues in the Office of the State Superintendent of Education on a series of “What’s Next?” workshops for center clients and others who complete their GED or diploma. The goal is to provide helpful information about options for post-secondary education, including pointers about financial aid and scholarships. The “What’s Next?” workshops sound like a great idea to ReEngagement Center client Tyrina Brown, who hopes to apply to colleges and universities in the District in 2017. Brown said she ultimately wants to pursue a career with the federal government. But right now, she’s focused on completing her high school education so she can attend the official graduation ceremony from her adult public charter school in June 2017. “I’m already planning to buy my own cake to celebrate,” Brown said.